There’s an attention ho in every flock; Dave was theirs. thats really funny… apart from being a really nice pic…. Ha ha ha! You are too funny. Are you really taking these with a camera phone? Those photos are so perfect they almost don’t look real. 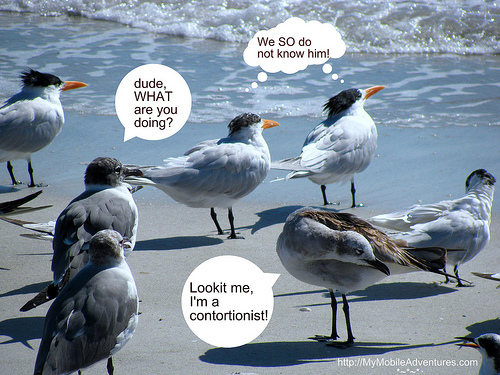 Seagulls just lend themselves to captioning. Great shots! That is good. You took some time over that and the shots on their own are fantastic! I joined in this week! Come see! Too funny! The photos are great, too! Tink, I’m smiling and laughing. Great post today! Too too clever Am I too technologically challenged to learn to make cartoon bubbles?? Love the captions! Good for a couple of chuckles. Nice photos too. Oh too funny, I love your captions!! 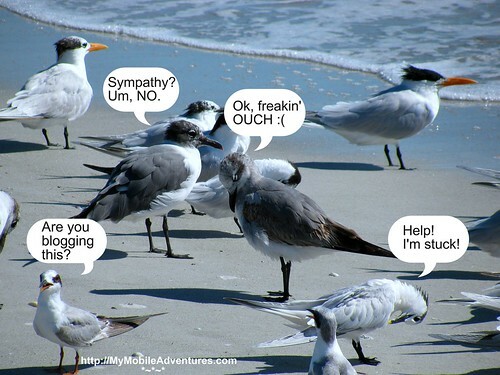 Agree with Kendris, seagulls are begging for captions. How funny thanks. I love the photos. That is hysterical. Well done. I actually thought I heard a bit of a NY accent there. Was I mistaken?? LOL. Too funny, especially the ” are you blogging this?” Loved it! Yep. Made me lol. Very creative and witty. I always wondered what they talked about. what a unique bird. They’re so amazing. Bwahahahahahaha – this is absolutely priceless! You had me laughing out loud here, Tink! Very, very creative and fun… and they are awesome pictures too! You’ve outdone yourself here! haha, fun conversations. I’d love to know what those little guys are really thinking. Great photos! Sooo clever…and so funny! I was going to say soooo true…as if I have some clue as to what these gulls would be saying. Excellent job! GAYLE, these photos were not mobile blogged with the camera phone. These are from the Canon SX110 IS that I bought myself for Christmas. I enjoyed your funny post. Great photos of the gulls! Beautiful clear & crisp images. You could probably sell this as a travel postcard, ya know. Great photos, nice job with the thought bubbles – sometimes they take away from the photo but these don’t. It all works and it all made me smile.